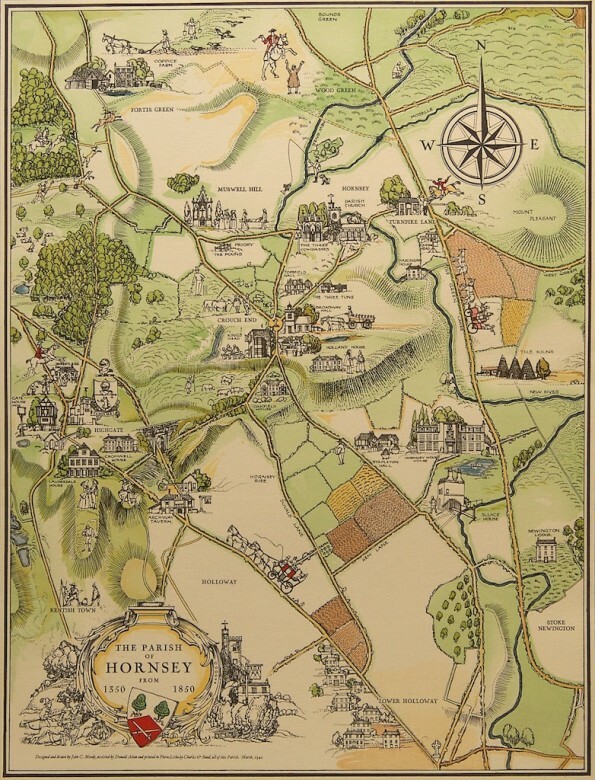 This map, a rather creative amalgam of older Hornsey parish boundaries dating from 1350 onwards, represents an approximate catchment area for a somewhat random collection of scenes and views which we locals ourselves sometimes miss - assembled here now mainly for the benefit of a far-away relative who wants to see what the area I inhabit is like. (Hello Clare!). Unless otherwise stated all the photos (it's probably best to view them in sequence as some are inter-connected, but it's not essential) were taken within the approximate confines of the map, though some were taken from the edges and look outwards. WYSIWYG does not apply here: what you see is not what you get because I have excluded any scene with a vehicle in it - unless the vehicle is the subject. Hornsey itself was heavily bombed by the Germans during WWII, when over 80 per cent of the houses suffered damage. The area covered by the map is predominantly contained within the modern London Borough of Haringey, where nearly 200 different languages are spoken. Although the visual impact of endless streets of vehicles has driven me, so to speak, to its open spaces and odd out of the way corners today’s photographer also has to deal with other hazards – at one time or another I have been told to leave by uniformed 'security' guards of questionable legitimacy, as well as being accused of spying for the Inland Revenue, Social Services and more recently Border Controls. So I have steered away from people - London is of course people - towards rus in urbe wherever I can find it. I am very grateful to Haringey Borough Council and to the Hornsey Historical Society and its contributors for constantly adding to my knowledge.